God’s perfect love changes everything – so enjoy it fully! Will God still love me if I continue to struggle with the same sin? What if I’m not great at loving others? Why don’t I feel sure that I have eternal life? Can I really know? 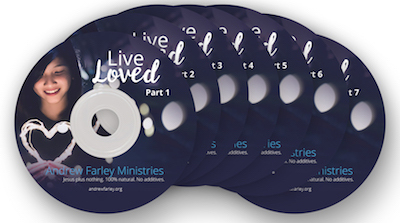 God welcomes our questions – and we point you to biblical answers in Andrew’s 7-message series called Live Loved. A beautiful journey through 1 John, this series shows you just how radical God’s love for you is! And it’s our way to thank you for sending a gift today to help more people know the love of our eternal Savior Jesus Christ. So remember to request your CD copy or digital download when you give below – and thank you for your generous support!